What can I say about a movie that has a rating of 9 on IMDB, is the official Indian entry to Oscars, is directed by Anurag Basu and boasts of Priyanka-Ranbir in the cast that you haven’t come across already in the newspapers, 3 weeks after its release? I usually don’t like to watch movies that reach such a level of hype within the first few days of their release that everybody has seen-heard-read-commented. More often than not, the movie fails to live upto the raised expectations. With Barfi!, it was different. The director has made good use of our sensitivity to emotions, flying high on scenes where sympathy fills our hearts like honey, sweet and touching. The cast has mastered a praise-worthy level of acting – @Ranbir: I didn’t know you could pull off a casual role so seriously that it seems so natural! @Priyanka: You, my lady, are the reigning princess of B-Town when it comes to killer performances, link-ups with SRK or otherwise! @Ileana: Welcome! 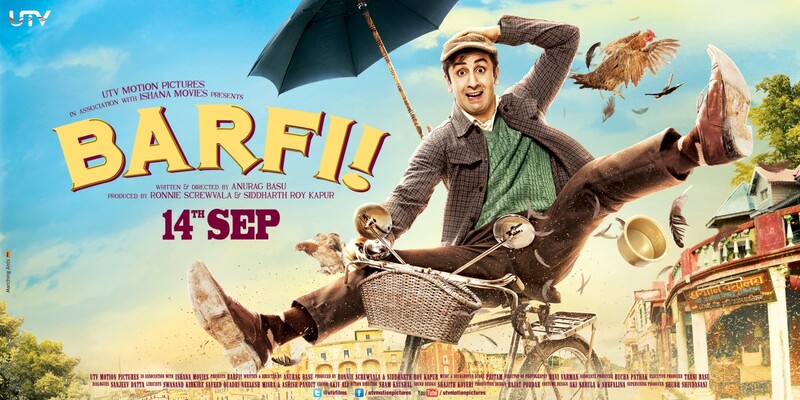 A very light-hearted beginning gets you laughing for the ingenious acts of Barfi, our hero. His comedy scenes are simply superb -- where he is apparently painting Ileana, or when the Policeman sees his reflection in the mirror and tries chasing it. Moreover, all the three introductions for the lead roles are well taken. The movie goes back-and-forth in time, taking you to 1972 Darjeeling with its downcast skies and bringing you back to Kolkata which offers characteristic scenes that filmmakers have always banked on to recreate India. The storyline by itself is a simple love triangle. What makes it stand out however, from Bollywood’s run-of-the-mill masala movies, is the way it has been treated. Yes, some of the scenes are blatant lift-offs from well-known movies and I don’t understand Basu’s justification that by doing so he is paying a tribute to them. Nevermind. If they didn’t bother our Oscars selection committee, why you! Watch the movie for what it offers. So, as you know by now, Barfi is deaf and mute. He has a sad childhood, with no mother and a driver father. But this doesn’t stop him from thrusting himself upon society with his crazy antics. One can’t not love him. He is the bubbly, effervescent character who takes life as it comes and makes sure he savours every simple thrill there is to be enjoyed. At times you realise how difficult, or to re-phrase myself – different, life is for Barfi. He can neither hear his own father having an attack, nor can he hear his love calling out to him in the climax. His feelings are solely realised through his actions and heart-touching expressions. Remember that Satyamev Jayate episode? Fretting and complaining about our lives, a convenient escapist trap which I am sure most of us fall into at some point of time in our lives, seems non-sensical from this perspective! On the other hand there is Priyanka’s Jhilmil. She is innocent, safeguarded from the world’s cruelty and grows up in a home for the challenged. Jhilmil shows Barfi, and us, to alter our materialistic look at this world. For her, just catching a butterfly can be the biggest pleasure. She trusts slowly and carefully. But once she does, its whole-hearted. She loves without thinking, without being constricted by society’s views. Her love is beautiful, worth dying for, whether its for the Maasi or the Daadu, or for Barfi as in the last scene. Ileana is the Third person in the movie, her character being our eyes to view the lives of Barfi and Jhilmil. She is easy to relate to; for being one who gets influenced, is not too confident and conveniently sets off to live life as directed by others. Hers is the everyday story. When the time comes for a life-defining choice, she takes the safer option only to spend the rest of her life regretting it and even ruining the choice she did make. “What is the point if you live like her? Don’t”, the director seems to be telling us. “Point noted”, we say. But it isn’t as easy as that, is it? Society. Family. Pressure. Status. Oh, the variables to be considered are way too many and each one of us has a different way of looking at it. Nevertheless, the way I see it, the message of the movie gets crystallised when we combine the 3 characters’ perspectives. Live happily like Barfi, no matter what is thrown at you. Live a pure life like Jhilmil, taking time out to enjoy all the sweet nothings. Live confidently and be responsible for your decisions, irrespective of what they are. P.S. The movie has hardly any series of dialogues, if you notice. No noisy interruptions. Its just beautiful music running in the background, one track flowing into the other. @Manoj True. But even GoW has impressions of City of God(Brazil) throughout the film and then it reminds everybody of Godfather, the music is full time lift from Italy or Spain(I don't remember clearly). Maybe we could sway ahead of this skepticism and just appreciate good cinema which is sort of rare in Bollywood these days.